Palmiera@Kinrara Residence is a mixed residential development nestled in the fast growing Puchong vicinity, right next to the breathtaking and pristine Ayer Hitam Forest Reserve. Sprawling over 125.8-acres of leasehold land, the entire residence consists of super links (terraces), semi-detached and bungalows. Other than Palmiera being the latest addition within the Kinrara Residence, it is also furnished with a 2-acre linear park with jogging paths, bicycle trails, children’s playground and even a clubhouse that houses condominium-like facilities. Previously, the security management in Palmiera, DSK Security Management Sdn. Bhd. was using a setup that could not provide the safety results required for the community as the system was slow, difficult to use and most of all does not consist of any real-time function. Seeing that the residence is a big area to cover, it is without doubt that a smart solution will have to be selected for the job. To secure the area and be prepared for the future, DSK Security Management settles with TimeTec Patrol solution for Palmiera Residence. 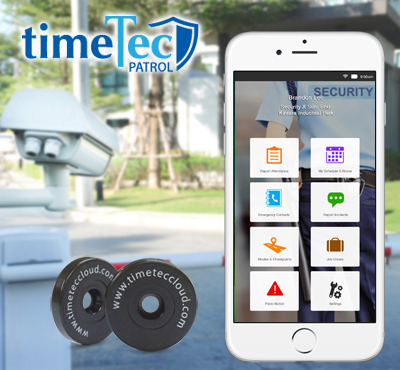 TimeTec Patrol is a cloud-based Smart Solution that assists security guards in handling and addressing their patrol activities straight from the convenience of a smartphone. With the help of NFC Tags, security guards within Palmiera Residence can notify the supervisor their whereabouts by tapping their smartphone on the NFC tag whenever they arrived at the assigned location such as the children playground or clubhouse within the residential areas. This provides the security management with transparency, which can be translated into better ROI of their security guards. On top of that, DSK Security Management can assign new tasks to the security guards on duty using TimeTec Patrol to increase efficiency. TimeTec Patrol is also equipped with incident report feature for them to send report of any incidents, send photos for evidence and even request for an S.O.S message to inform the authorities in charge and act accordingly during emergencies. With this level of security in placed by TimeTec Patrol, the residents of Palmiera will definitely have peace of mind while going on about their daily activities. Using TimeTec Patrol along with NFC Tags installed at strategic locations, the security management of Palmiera Residence, DSK Security Management Sdn.Bhd. can definitely ensure a much safer and efficient patrol operation not only for the residents of Palmiera but also for their patrol guards being assigned there.